Here in the Pacific Northwest, we’re blessed with an abundance of rainfall. Seattle, alone, averages 37 inches of rain, just 2 inches below the National average. We do get our dry months, however. Many Northwesterners prefer to let their lawn go when the sun shines, knowing it will be back as soon as the rains resume. In fact, letting it go dormant can be healthier than repeatedly rescuing it from disaster. The leaves might turn brown, but the parts undergrounds stay alive for months. Promote root growth by watering your lawn deeply. Let it dry somewhat before the next watering. A good guideline to follow is to water 1–1.5 inches (2.5–3.25 cm) of water per week during the growing season, an increase it to 2 inches (5cm) during hot, dry weather. Choose the proper time to water. Late in the evening and early in the morning will reduce evaporation from the midday sun. How much sprinkler time yields 1-2 inches, you might be asking yourself? To find out, place open containers around your yard. Turn on the sprinklers for 20 minutes, allowing the containers to catch the water. Measure the depth of water in each container. Multiply the average depth by three to find the inches per hour. Make sure to mow at the highest setting. Maintaining taller grass helps shade the ground. This, in turn, blocks weed sprouts and promotes beneficial microbes. Letting the grass grow taller also allows your lawn to focus on root growth, which adds disease resistance. Don’t bag your lawn clippings. Leave the grass clippings on the lawn after mowing to return the nutrients to your lawn. Mow in a different direction or pattern than your last mow to help the grass grow more evenly. Select the proper fertilizer. Ideally, you’ll want a mixture of 30–50% slow-release fertilizer and 70–50% fast release fertilizer. This gives the lawn an instant boost, but still slowly adds more nutrients over the next few weeks. Organic fertilizers are preferred over synthetic fertilizers, since they improve soil health as well. Following these easy tips will keep your lawn in good health, providing a soothing place to relax during the summer, a great space for entertaining, or a sturdy, soft environment for the kids to play on. 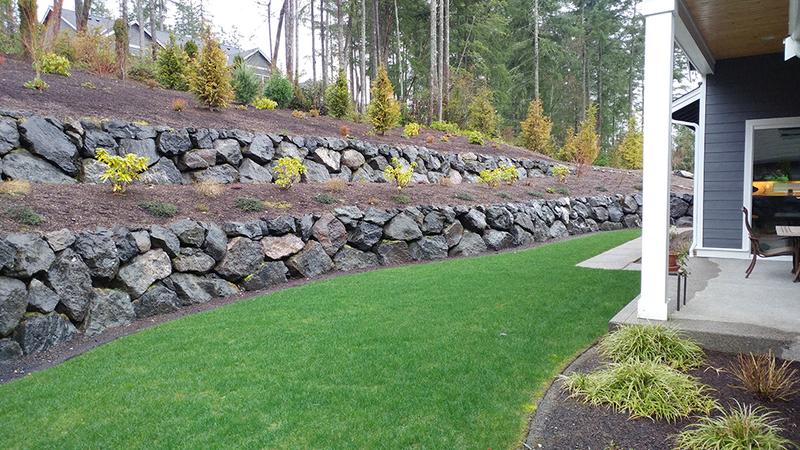 If you need help with lawn care, planting a new lawn or establishing sod, adding a sprinkler system, give us a call at (360) 876-6567. ← Why Discard It? Use it in your Garden!